Clarins’ newest launch is the Daily Energizer range, targeted at a slightly younger age-group than standard Clarins products. I was interested to see that the new range includes a cleansing gel that looks really quite similar to the Pure Melt Cleansing Gel with Marula Oil that I’ve been using for years. The Daily Energizer Cleansing Gel costs £10.50 for 75ml, the Pure Melt costs £18.50 for 125ml. Price per ml, then, is 14p for the DE version and 14.8p for the PM. Not a vast amount of difference, price-wise – I’d have thought that the younger range would be much less expensive. Yes, the purchase price is obviously less, but you’re only getting just over half of the product volume! 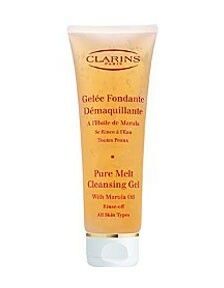 The Pure Melt Cleansing Gel has long been a favourite of mine because it does a great job of removing makeup. It goes on as a gel, massages in as an oil and rinses off as a milk. Job done. What I want to know is this: is the newly launched Daily Energizer version better? More effective at removing makeup? Better for younger skin? Better for older skin? Which is the better deal overall? We’ve established that it’s certainly not that much cheaper, so let’s find out how it performs! The difference between the two formulas is instantly apparent when you massage the gels into dry skin. (The Daily Energizer version is supposed to be applied to damp skin, but I wanted to see how the gels behaved!) The Pure Melt cleanser turned in to a light oil and stayed that way – it wasn’t too greasy, but it did an amazing job of removing my eye makeup. The Daily Energizer turned a soapy white. It was slightly stingy on the eye area, but it does say to avoid the eyes, so that was my own fault! The Pure Melt rinsed off as a milk when water was added, taking the makeup and dirt with it. The skin felt nicely clean – not too tight and squeaky. The Daily Energizer rinsed off very easily and left the skin feeling fresh and toned. I think this is where it has a very different purpose to the Pure Melt – it freshens and brightens skin without adding excess oil. Important for younger, hormonal skin that might need a bit more of a ‘careful’ cleanse. This didn’t leave my skin tight either, which is a very good sign – it’s not stripping oils away from the skin, it’s just gently taking away the excess. What’s my verdict? Well, considering that they’re approximately the same price, I’d have to choose my cleansing gel based solely on my skin-type. Oily skin, even more mature, might benefit more from the Daily Energizer gel, whereas I’d definitely recommend the Pure Melt with Marula Oil for normal skin, and most definitely dry skin! I think that the Daily Energizer is actually an excellent cleanser for the younger range – fresh and speedy. It’s more of a ‘face wash’ than the Pure Melt, there’s no luxurious massaging opportunity! The Daily Energizer Cleansing Gel is £10.50 from Boots HERE and the Pure Melt is £18.50 from Boots HERE.